This hybrid model provides the standard features found on the existing PD130 range as well as A.F.S. (Automatic Frequency Selection) found on the PD160 range. This feature ensures less set up time, thus simplifying the installation of complex multi-lane access control sites. Furthermore this ensures a low cost of ownership, complimented by a full 5-year manufactures warranty. AFS: The Automatic Frequency Selection allows the ability to automatically select the best frequency setting by minimizing the noise and maximize the signal strength. Diagnostics: Comprehensive diagnostics capabilities allow for accurate diagnosis of loop and installation problems via Nortech’s DU100 or DU700. Selectable Pulse Width: The option to select either a 150ms or 250ms response time is now switch selectable. Selectable Permanent Presence: The output of the presence relay can be selected to maintain an output for an indefinite period, eliminating premature barrier, gate or door closure. 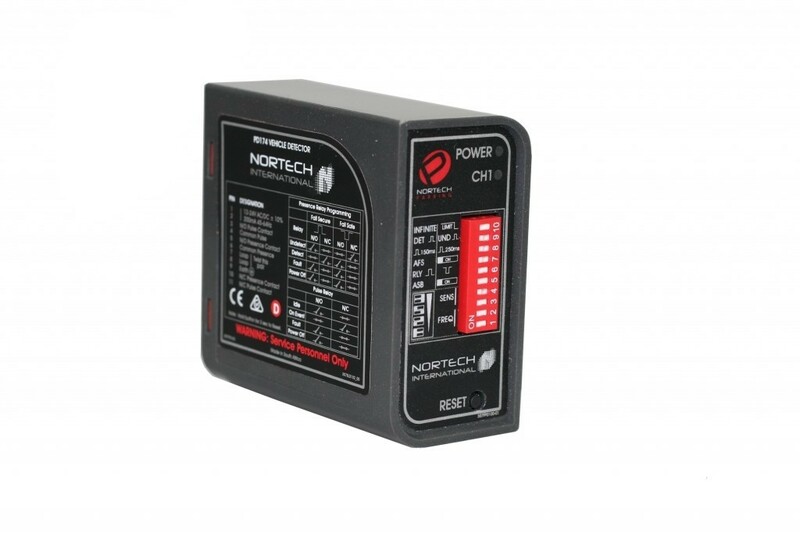 Pulse Relay: The relay can be selected to provide a pulse output either on detect or on undetect. Automatic Sensitivity Boost (ASB): Facilitates the reliable detection of all vehicle combinations and high-bed vehicles by boosting the sensitivity to maximum after detection of a vehicle. Fail Safe or Fail Secure: The option to select the relay output polarity is now configurable from a switch on the front panel.